When a medical problem suddenly develops, you may not know whether to go to an urgent care facility or to an emergency room as you might not be aware of the difference between urgent care and emergency care. You can actually go to either, but for non-life-threatening injuries and illnesses, there are compelling reasons to go to an urgent care instead of the ER. When Should You Go to an Emergency Room? If the situation turns out to be serious enough that you call 911, the ambulance or paramedics will automatically take you to the emergency room, which is equipped to handle many types of life-threatening problems. But that extra capability comes at a cost: ERs cost considerably more than urgent care centers, and the wait time can be several hours for non-emergency conditions. When Should You Go to an Urgent Care? Urgent care centers are for non-life-threatening problems that stem from daily living. They are open for more hours than most doctors’ offices, have more on-site treatment options, and cost significantly less than an ER visit. By definition, doctors at urgent care facilities are able to evaluate and care for anything that isn’t an emergency. The ideal medical care comes from a physician who knows your history inside and out. But if they’re not available for a problem that can’t keep, or you don’t have a regular doctor, the urgent care is a timely, convenient option. And for true medical emergencies, the ER is open, 24-7. As you now know the difference between urgent care and emergency care, visit the right one depending on your medical situation. 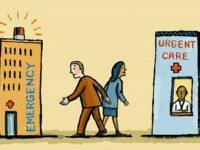 Emergency, Primary, And Urgent Care: Why Should I Care? It’s good to know that urgent care centers are open for more hours than the hospital to accommodate patients. Emergency cases such as infections, fever, and sprains happen at the time we least expect it, and it will be helpful to know any available clinics in the area who can attend to your urgent needs at a lower cost. Since I live alone, I will look around to see any after-hours clinic in my area for my future reference. Thank you! If you reside in these areas- Irvine, Fountain Valley and Costa Mesa, you can contact our urgent care centers based in these three locations. We are open 8 A.M. to 8 P.M. Mon-Fri, 8 A.M. to 5 P.M. Sat. & Sun. I have never heard about urgent care and how it is different from an emergency cure. So I am grateful that you explained that it is for non-threatening problems and how this kind of care is open for more hours than doctor’s offices. My younger brother currently has a sore throat, and we plan to bring him to a doctor. But it appears that it is more advisable to go to an urgent care. Thanks for the tips! Thank you for appreciating our article. We are glad that you got the difference between urgent care and emergency care. Thanks for pointing out that things like nausea, rashes, and sprains are the sort of things that you should go to the urgent care for instead of the ER. My son was playing soccer with his friends yesterday, and he hurt his ankle. It’s still hurt, so I think that it’s sprained. It seems like I should find an urgent care center to go to. It’s recommended to visit an urgent care center in such cases. If you reside in these areas- Irvine, Fountain Valley and Costa Mesa, you can contact our urgent care centers based in these three locations in case you need any help in the future. Thanks for helping me understand that urgent care is the one responsible for problems that are not life-threatening yet. It’s also great that you mentioned that it is usually open for more hours than doctor’s offices. It made me curious about this type of care because I heard that my mom is going to look for a medical facility that offers this first thing in the morning tomorrow. This is because my father has been having rashes for days now. Knowing this information, I will tell her that she can even take dad late at night since it is open for a longer period of time. Thanks! If you reside in Calfornia, you can schedule an appointment or visit our urgent care centers, i.e. Fountain Valley Urgent Care, Woodbridge Walk-In Urgent Care & Costa Mesa Urgent Care. Thanks for explaining that emergency room visits are considerably more expensive than urgent care. It is a good rule of thumb to visit the ER only in serious or life-threatening situations. If it is something else, but still a condition that can’t wait for a doctor’s appointment, I will be sure my family visits an urgent care facility. This is good to know because my husband often gets persistent painful stomach aches. We’re are glad to hear that you got the difference between urgent care and emergency care. If in future, you or your family need any sort of medical urgent care, then feel free to visit our urgent care centers located at, i.e. Fountain Valley, Irvine & Costa Mesa. I really appreciated your clear distinction between an emergency room and the urgent care, especially if your situation is life threatening or not. My wife and I recently had a baby, and we have been very paranoid about what to do if our baby got hurt! I will be sure to take our daughter to the urgent care if it isn’t life threatening! Thanks, Ken for appreciating our article. If you reside in Calfornia, you can schedule an appointment or visit our urgent care centers, i.e. Fountain Valley Urgent Care, Woodbridge Walk-In Urgent Care & Costa Mesa Urgent Care. It’s good to know when to go the Urgent Care. I like how you said that they can help with the stomach flu and that sort of thing. What if my son is complaining about stomach pain, but I’m not sure what it is? My sister is not feeling well and she’s having a hard time because of her cough. It was recommended here that she can go to urgent care clinics when dealing with a cough and flu. Furthermore, it’s advisable to go to trusted urgent care clinics for quality health care. Yep, emergencies are emergencies, but unless you show serious signs, you won’t get treated as an emergency case in the ER. Good chance you’ll end up waiting several hours to get overcharged for what turns out to be basic medical care. This is some really good information about urgent care. It is good to know that if you have a rash you can go to urgent care. That is good for me to know because I think I have a heat rash. Thanks for pointing out the difference between emergency and urgent care. I didn’t know that emergency care is more equipped to handle many types of life-threatening problems. I have a 5-year-old son who’s very active so he’s prone to all kinds of injuries. I’ll be sure to find a healthcare service that can nest provide the treatment that he would need in the future. Yes, emergency care can handle many life-threatening problems while urgent care is for something that is not an emergency. Visiting an urgent care is recommended for minor injuries. I like how you mentioned that a minor concussion can be taken care of at an urgent care center. One of my friends loves to go to the emergency room for even the smallest thing, so this article will really help her out. I’ll be sure to share it with her the next time we have lunch. Yes, surely! Urgent Care Centers has been set up with the motive to provide better medical support for all non-life threatening problems. Urgent care is even more affordable in comparison to emergency care. I like how you simply put that emergency rooms are for emergencies. Too many times people overreact and go there when a walk in clinic would offer the same services. This is only going to crowd out those who actually need emergency assistance. My son has a bad sinus infection and we won’t be able to get into our regular doctor for a few weeks, so I am thinking about taking him to an urgent care clinic. You make a great point that urgent care centers have more options for on-site treatment than a regular doctor’s office and is a lot less expensive than going to the emergency room. Because my son’s infection is not an emergency, I think that visiting an urgent care could be a great way to get him the care and prescriptions that he might need. So what you are saying is that in case of anything immediately life threatening one should go to emergency room and otherwise ist okay to turn to your closest urgent care center? Thank you for making this clear to us. We had an embarrassing event with our 3 year old son as we took him to an emergency room when he was experiencing some mild stomach issues. It is worrisome to think that someone might be ill-prepared for emergency situations. My sister has been thinking about this and needs to learn how to be prepared. Knowing that emergency care and urgent care are separated by life-threatening circumstances is helpful.